Resorting to a visual gimmick to aid in some late-season storytelling doesn't necessarily have to be a bad thing. 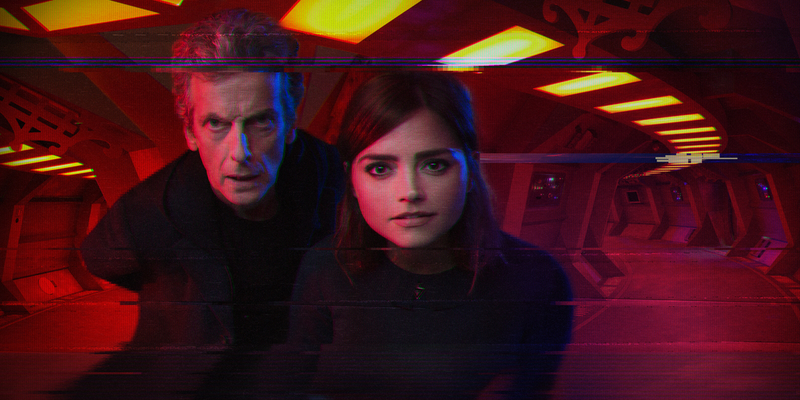 Doctor Who certainly makes the best of it during 'Sleep No More,' wherein the hour seemingly slips in the tiniest hint of worry about Jenna Coleman's soon-to-be-departing Clara, in order to elevate the episode slightly above the messy use of found footage and an overall clunky script. Both in structure and in its use of a rapidly aging device, 'Sleep No More' feels reminiscent of things that have come before. Most notably, the episode echoes the plot of 'Under the Lake' from earlier in the season. That episode featured the Doctor and Clara running around a strangely circular compound, being chased by ghosts bound by just enough of a set of rules that the heroes could conceivably navigate the otherwise hostile environment in order to survive. This time, instead of a submerged military base and a group of aqua marines, the Doctor and Clara find themselves on a space station accompanying a group of space marines – which affords the two an opportunity to engage in a conversation about applying the word "space" as a lame modifier to other words. The casualness of the conversation pierces the settings' familiarity in a way that is almost meta without being too cute about it. Watching the story unfold via first person is disorienting at first, as it deliberately filters how the viewer gains information in such a specific way the advantage is not immediately apparent. Viewers may be reminded of a similar experiment done on Cinemax's Banshee, wherein the first person/found footage aspect was used to make an otherwise conventional heist a unique viewing experience told from four distinct perspectives almost simultaneously. There the natural limitations of the format enhanced the tension of the sequence in the exact moment the sequence unfolded. Here the device is used primarily as an aid to exposition. The episode explains the need for the found footage ploy by introducing Dr. Rassmussen (Reece Shearsmith) first, announcing him as the chronicler of this particular adventure. By allowing Rassmussen to steer the narrative ship as it were, the Doctor and Clara become players in someone else's story, which frees the characters up in a way the episode almost immediately capitalizes on. It allows them to make the sort of casual mistake that might otherwise be too obvious had it occurred from the perspective of either character. In this case, Clara's off-screen abduction by a Morpheus machine, the AI of which has determined she was in the need of a nap. The Morpheus machines are actually rather interesting. Beyond the retro sci-fi use of 'Mr. Sandman,' accompanied by a charming little hologram that may or may not be the Chordettes (whose version of the song is likely the most recognizable), the machines also function as a way for Doctor Who to comment on the military industrial complex and capitalism, both of which, in this scenario, see the need for sleep as a bug just waiting to be worked out or at least circumvented. As with most technological breakthroughs that impact the way humans live their lives, there is a terrible, unforeseen cost in the form of monsters comprised of "sleep dust" – which is a really cute way of saying "eye boogers" or "crusties" – the stuff that accumulates in the corner of your eye while you're off in slumberland. Naturally, the monsters have a specific set of rules: they stalk the corridors of the Le Verrier Space Station in search of human bodies to consume, but being made of eye boogers, they are ironically sightless. Additionally, their bodies are susceptible to shifts in gravity but apparently not military grade weaponry – not that the space marines think to use their rifles as anything other than a club on their dusty adversaries. But 'Sleep No More' isn't really about the monsters on Le Verrier; it's about the potential threat Rassmussen's creations – both deliberate and inadvertent – pose to humankind. And, more precisely, it's about the threat to Clara Oswald, and what her time in the Morpheus machine means to her character moving forward. The two-part structure of the episodes this season makes it a challenge to discern the immediate stakes of the plot during the first half. But 'Sleep No More' is different, which raises a red flag of sorts meant to go along with the Doctor's demeanor when Clara inquires as to his ability to correct the effects of the Morpheus machine. The hour doesn't end on the kind of cliffhanger most have, which is to immediately raise the stakes and create a bridge to the second hour. Here, 'Seep No More' operates almost as a standalone episode, especially as it ends so abruptly and resolves neither Rassumssen's creatures nor Clara's exposure to the device that creates them. The narrative bridge, then, is less an immediate threat to one character or another, and more of an uncertain complication left to linger and build, like a bit of crustiness in the corner of a sleeping person's eye. All season long, Doctor Who has made clear the emotional connection between the Doctor and Clara, and what it would mean if he were to lose her. The unresolved nature of Clara's interaction with the Morpheus machine is compounded by Capaldi's performance, which transcends the episode's awkward plotting and the seeming irrelevance of many of its supporting characters. Whereas 'Under the Lake' and 'Before the Flood' managed to craft thin but meaningful stories around certain aqua marines, making their importance to the story something greater than being mere cannon fodder – O'Donnell in particular underlined the Doctor's alien nature, as well as the emotional bond he shares with his companion. This episode makes no effort to underline or to draw such a conclusion. And yet the absence of those elements feels deliberate in a way that hints at something greater and more worrisome. It's not enough to call the episode itself or its use of a gimmick a success, but it does hint at a narrative value down the line.